THOSE were days of hard drinking as well as hard riding and hard fighting. The man who did not drink in some degree, was regarded as something of a freak, and as lacking the social spirit. Stories innumerable, tragic, pathetic, humorous, may be told of Dodge City and her people, showing the place that intoxicants filled in the life of the time and place, and with their plots centering around the glass and the bar of the frontier saloon. In the early days of Dodge, the town was often visited by a traveling man whom we will call Thomas Smith, who is now a very wealthy Christian gentleman, worth a million, and now making amends for his early debauches by charitable work, teaching poor boys the way they should go. This salesman would always put up at the Dodge House, and when he had finished his rounds among his customers and finished his work, he would proceed to get on his usual drunk. His firm would wire Mr. Cox, proprietor of the hotel, to take care of him until he recovered from his spree and send them his bill. Of course he had hosts of friends, as he was a fine fellow as well as salesman, when sober. The hotel was built clear through to the other street and, in building back, the floor at the rear was below the surface of the ground, as it was a little up-hill from the front of the house, and this placed the windows of the back part level with the ground. Now, Tom was in one of these rooms with the window level with the ground, and of course the window was exposed. Tom was getting a little over his spree. He had been seeing snakes. had been given an opiate the night before, and of course he was dead to all noises until the effects of the drug wore off. But about breakfast time, Mr. Bear turned over and groaned. This raised Tom up in the bed and, at the same time, the bear's chain rattled. Tom said to himself, "My God! have I got 'em again?" But Mr. Bear made another move which lifted Tom up again. This was too much. He jumped out of bed, hastily lifted the bed clothes, and there was Mr. Bear, staring him in the face, yawning, and rattling his chain. Tom gave one tremendous scream and rushed for the dining room. Breakfast was in full blast at the time, the room crowded with guests, and with six girl waitresses. When Tom rushed in in his nightgown, he tripped and fell over one of the girls, with a waiter full of dishes. Of course they both went down together, and of all the screaming and holloing, and rushing out of that dining room, was a caution. 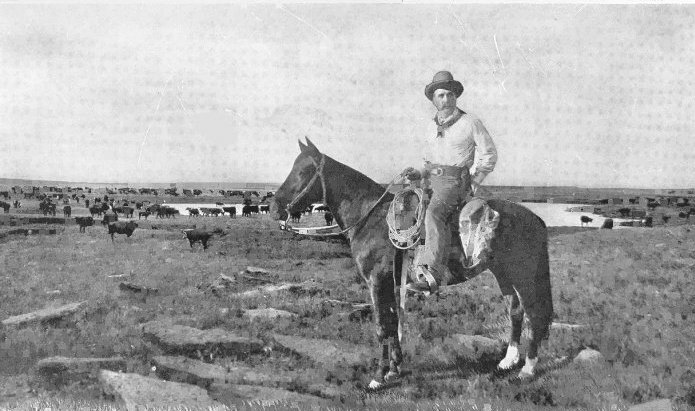 Another time Tom got on one of his sprees at Caldwell, Kansas, another wild and woolly cattle town like Dodge, and the boys hired a trained monkey, from an organ grinder, and put it in his room one morning before day. Tom was convalescing and they thought a big scare would do him good and maybe break him of his sprees. Tom was awakened about breakfast time, with the monkey sitting right over him at the head of his bed, where the boys had placed him, chattering away and cutting up all kinds of monkey tricks. Tom said he was sure he had them again. But recollecting his six-shooter, he went to his suitcase, got it out, and said: "Old fellow, if you ain't a monkey, I am in a bad fix; but if you are a monkey, you sure are in a h-l of a fix." Then he took good aim and fired. Down came Mr. Monkey, and the boys lost a hundred dollars and the joke was on them. of the trade, and was capable of working all the various devices known to the brotherhood, from the opening of a spring match safe to the gold brick proposition. He had the brains to use them all, but whisky was what caused his downfall. He could not keep away from it. At one time, he abstained from drinking for a week. He came across the "dead line," where he had been staying to keep from drinking, and was very "blue", downhearted, and nervous. When he reached the precincts of the "gang", he was subjected to the ridicule, "kidding", and taunts of the fellows. It was a cold snowy morning, and the river was out of its banks and full of immense cakes of floating ice and a quarter of a mile wide. Bobby said to the "jokesmiths", "Kid as much as you please, but it takes more nerve to stop drinking when in the condition in which I have been, than it does to go down to the river now, strip, and swim across to the other bank." I believed him. I can sympathize with such a man because I have been in the same condition myself. He was right and I knew he told the truth. One of the many times he was before the police court was due to hard luck. He was clear down and out of pocket and friends. One could discover a kindly feeling for him, for, as a general thing, when a man plays in such hard luck, no matter what his antecedents, one can't help pitying him. One's heart goes out to him, and so it was in this case. The sentence was twenty dollars and costs. The marshal said, "Well, so far as I am concerned, I am willing to throw off my costs;" the clerk said, "I will do the same;" and the judge said, "So will I. Mr.
Gill, what have you got to say for yourself?" He promptly jumped up and, quick as a flash, and said, "Your Honor, I never was yet out-done in generosity, and I will not be in this case; I will throw off the fine." It is needless to say that he never paid any fine. ing off a big, drunk. There was a ledge of wood all around the room about three and a half feet from the floor. Bobby had his chair tilted back and his head resting on this ledge, with a broad-brimmed Stetson hat half over his face. We put a line of powder along on this ledge, from the door to where Bobby was sleeping (which was quite a distance from the door), and near his head we placed a full quarter pound of the powder, pulled his hat well over his face to thoroughly protect it, and stationed several men in the saloon with six-shooters, and the large tin pan, used for making large quantities of "Tom and Jerry", was so placed that the most noise possible could be made when it was hit with a club by a man. The signal was given and the powder touched off, the six-shooters were fired, and the clubbing of the tin pan began while the bar and tables were hammered with billiard cues. Imagine the noise and confusion. The smoke from the burned powder was so dense that one could scarcely see. Bobby made a dive for the door and cleared the way before him. There were some men sitting around the big stove; Bobby ran right over them and, when he encountered a chair, he just threw it over his shoulder and continued his flight. He said afterwards he had been dreaming about fire and, when the racket began, he imagined that he was in a burning building, from which all but himself had escaped, and he could see the burning rafters falling down upon him. He never opened his eyes but once, and never stopped running until he was home, on the other side of the railroad track. This was one good treatment for him and his complaint, and he was not over on the north side again for a month. He was afraid we would kill him and he actually believed so. in a helpless state of intoxication. They covered this crate with an ample tarpaulin, entirely concealing the contents from view. Attaching a team of mules to the wagon, they drove up Main Street, stopping in front of each saloon for exhibition purposes. Bobby acted as crier and opened the proceedings by shouting: "Come, everybody! this is the golden opportunity. We have here on exhibition, concealed under this tarpaulin, the greatest living curiosity-the only living specimen of man and brute combined, captured in the wilds of the Ozark mountains in infancy, and reared to his present physical state on the bottle, which has been the only nourishment he was ever known to take. For countless centuries, scientists have searched in vain for a living specimen of this lost link. Gentlemen, it has been the good fortune of my scientific co-worker, Professor Riley, to discover, hidden in the sand hills, this longsought specimen. We have a living proof of the Darwinian theory of the origin of man, and 'it is my pleasure, gentlemen and ladies (if you are ladies), to be in a position to prove to you, by ocular demonstrations, the truthfulness of my assertions, for the small sum of one iron dollar-four quarters, two halves, or ten dimes turn the trick, and, while I pass the hat around, Professor Riley will take the pole and stir up this monstrosity." Kinch would then stagger around to the oft-side and proceed to stir up the living specimen by vigorously prodding him, in the mid-section, with a broom stick. The sports would "chip in," and soon the necessary dollar was raised, the tarpaulin would be removed; and the fun would begin. Bobby would order a "whisky sour" for himself and Kinch, and they would slowly sip the nectar, in plain view of poor parched Dalton, who would plead for just a taste. as a loon. Bobby was deaf to his pleadings for a long while; in fact, he didn't relent until the last saloon had been worked. Then, in a maudlin tone, he ordered Kinch to feed the specimen. Kinch had an empty tobacco bucket handy, and a small force pump with hose attached. Turning this on poor Dalton, he soused him with several buckets of water. The performance then closed, and Bobby and Kinch mounted the wagon and started over the "dead line" with their living curiosity. Their frequent libations of "lemon sours" had all but knocked them out, and they were much worse off than Dalton, who, through their heroic treatment, was now in a fairly sober condition. In crossing the railroad track, Dalton worked a bottom board loose and dropped to the road, the wheels miraculously missed him, and he got up none the worse for the drop. Bobby and Kinch were slowly plodding along, ignorant of Dalton's escape, when, suddenly, they were brought to a realization of the situation by a bombardment of rocks, at short range, from Dalton. In dodging the missles so ruthlessly hurled at them, they lost their balance, and both fell off the wagon, and the mules proceeded leisurely on their way to their barn. accorded Dalton, but equally heroic, was a "Dodge City Keeley Cure," administered to one of the convivial citizens. In the bright, halcyon days of Dodge City, there dwelt a lawyer in our midst, who was quite badly crippled, but he had a bright mind and was a good lawyer. He, unfortunately, was addicted to the liquor habit, and his earnings were spent for whisky. He neglected his wife and children, and his conduct was such as to become a disgrace to the civilization of Dodge City, so the boys concluded to put a stop to it. One bright summer morning, this lawyer was drinking heavily, in one of the principal and most public saloons in the town, on Front Street, where everyone could see inside, as they passed, as there was a door on each street, the saloon being on the corner of two streets. The fellows that decided to administer this dose of the "Dodge City Keeley Cure" to the lawyer, waited until he was surcharged with booze, which they knew would soon be accomplished. He attempted to leave the bar, but fell in a drunken stupor. The boys then procured a coffin, attired him in a conventional shroud, prepared him as carefully as though they were preparing him for the long sleep, except embalming him, powdered his features to give him the ghastly appearance of death, tide his jaws together, and then placed him in the coffin and placed the coffin on a table between the two doors, where he lay "in state", and in view of passersby. after looking in the mirror, he went home completely disgusted with himself, sobered up, and was never known to take a drink in Dodge City afterwards. He became one of our most respected citizens, and held several offices of honor and trust. This was a profitable lesson to him, and proved very beneficial to his family and the community. While the above is highly recommended to those needing the Keeley cure, it is not guaranteed to cure all cases. It depends on the mental and physical make-up of the individual. We tried the same treatment on a prominent hotel man, the best landlord Dodge City ever had, but it was not successful in his case. When he recovered, he jumped out of his coffin, shook off his winding sheet, and proceeded to the bar, with an invitation to all the boys to have a drink. Truth is stranger than fiction, and, to illustrate, the following story of early days in Dodge is related. Every word of this is positively true. to resort to most anyone, until he got a Frenchman who could speak no English. The gang soon got on to the ignorance of the barkeeper, and played many a prank on him, and they finally got to passing counterfeit dollars, some a good imitation made of lead. Now Skinner and Kelly had opened up an opposition joint, around the corner, a few doors below Heinz' place. Heinz had a natural hatred for Skinner, and when he opened up in opposition, Heinz' hatred was much greater. don't suppose he had eaten anything since he left here last night." I invited the home up, and they all took beer, and I handed Skinner the counterfeit. He served the beer, and, without looking at the dollar, threw it on the back bar with the day's receipts, and gave me the change. 1 sat and talked with them for awhile, and invited the crowd to drink again, then went back to Heinz, who was tickled to death about it, and we went below and got our beer. Just before starting back up, however, the bell boy came after Heinz, saying there was a Dutchman upstairs who insisted on seeing him on particular business. Heinz said, "Stay, and I will be back soon." Now it seemed the night before, a short time before the passenger went west, John Shults cam in pretty full of booze, as was his normal condition when in Dodge City, and asked Charley Heinz to change a five dollar bill. anxious to get the bill changed; he would save half a dollar. Heinz came back laughing and tickled to death. He said to the bar keeper, "Set them up to the house again, for this is too good; I have heard from the counterfeit already." When he went up, John Shults was there, holding the same old counterfeit in his hand, and he said: "Hensy, you know last night you gave me a counterfeit, didn't you?" Heinz said, "Yes, but John, a little after you gave me the bill to change, you came back, and I took back the counterfeit and gave you a good dollar in its place, didn't I?" "Yes, but Heinzy, how the h- did I get dot?" showing the counterfeit in his hand. "Heinzy, there could not have been two of them, could there?" "No, John, only one, only one." "Well, Heinzy, you couldn't give me a good one for this now, could you?" "No, John, I could not." "Well, Heinz, what's de madder wid it, anyhow? I know you gave me dis dollar." "Yes, I did, but I gave you a good one in place of it." And Heinz said he begged so hard to have one that he had to leave him, or he was afraid he would give him a good dollar. It seems, after Heinz changed the bill for Shults, the night before, Shults went down to Skinner's joint and ordered a glass of beer, offering this same counterfeit dollar in payment. Skinner was very angry, because he had been a victim of counterfeit dollars himself, and he took his knife and put a private mark on the dollar, and gave it back to Shults, with a big cussing, and warned him not to try to pass one on him again or he would beat him to death. dollar." "Yes," said Kelly, "that is so. I am not fit to do business any more in here; I make a failure of everything." "Who was in here?" said Skinner. "Why," Kelly said, "No one; it is a very bad day, and there has been no trade." "Why," Skinner said, "who ate up all that lunch?" Kelly said, "By the hokey, old John Shults, and he gave me a silver dollar." Skinner said, "Where did he go? I want to get at him. He is the drunken bloat who tried to pass in on me last night. It is the same dollar; see where I marked it? And I told him then I would beat him to death, if ever he attempted to pass it on us again. Where did you say he went?" "Over to your brother's restaurant upstairs," replied Kelly. Skinner rushed out without coat or hat, and caught Shults just as he was about to get down from one of those very high chairs, they have for counter lunches. He caught him by the back of the collar and hurled him violently again the floor. Before the man could get up, Skinner was on him, kicking and stomping him with both feet. Shults was helpless, and so completely taken by surprise it paralyzed him, but this did not stop Skinner, who kicked, stomped, and beat until he was worn out. The beating he got would have killed a common man, but old John was as tough as a pine knot and soon got over it. They say it was amusing to hear John holler and plead. "Ho (lam)! (Ho (lam)!" he said. "You got the wrong man! I do nottings to you! Why you do dot? beat Skinner just as hard, as Skinner acknowledged afterwards that he had completely worn himself out. These stories, in connection with other passages in this book, will give some idea of the position strong drink occupied in the early life of southwestern Kansas, and the almost universal popularity which the social glass enjoyed. Eventually, it was my fortune to become representative of this section in the state legislature, in which I was serving when the prohibition bill was introduced, in 1881. I must say that I think that prohibition has proved a good thing for the state, but, at that time, with such constituents behind me, I could not consistently support the temperance bill. I soon saw, however, that it was going through and that it was useless to fight it, so I contented myself with having the consoling "last word," on the subject, my short speech being the last made before the bill was put to vote. My remarks were not intended as argument, but merely as a mildly satirical fling at the opposing faction, and put a flavor of the burlesque upon the situation. But the threat to secede, while not meant seriously, was not without point, as the territory in sympathy with that I represented, forming one section for judicial purposes, comprising thirty-eight of our present counties. The "Topeka Daily Commonwealth," of February 16th, 1881, says, "Honorable R. M. Wright delivered. here to prove this, as many of the members of this committee have done in discussing this question) to increase and multiply, and accordingly he multiplyeth extraordinarily, and he doeth this without irrigation either, and in fact every farmer has an abundant crop without the trouble of cultivation. Now, sir, the only known preventive, the only known antidote to the venom of this venomous beast, is pure unadulterated corn juice, vulgarly called whisky. Aye, sir, men who have imbibed freely of the corn juice have been bitten, and the snake has always been known to die instead of the man, so you see it is not only a sure cure for the bite but is a speedy means of getting rid of the snake also. , "Ponder, oh, gentlemen of the committee, and hesitate before you take away from us that which saves life. Are you aware of what you are about to do? Do you propose in this arbitrary manner not only to deprive us of a source of solace but even to take our very lives? My people, sir, will never submit, never (No Pinafore here.) (This was in the days of Pinafore.) "Now, sir, the only way out of this labyrinth of proposed injustice is to exclude Dodge City as well as all that region west of the one-hundreth meridian from the provisions of this bill. If you do this it will not only be an act of justice guaranteed by the constitution upon stern necessity, but will receive the righteous judgment of all the citizens of Dodge; harmony will again prevail upon the border, the scouts will be called in, and future generations of cowboys will arise and call you blessed." In the spring of 1885, preparations were made for the enforcement of the Prohibitory Liquor Law in Dodge City, and the sale of eighty barrels of four-year-old whisky, besides other liquors and bar fixtures was announced by Henry Sturm, the well-known purveyor of the city. The prohibition law put a different character on liquor sales, many of the saloons being transformed into "drug stores."